Hexaline - Play Online - Casino Answers! Hexaline is a regular hexagon-themed online slot game. Microgaming Software Systems introduced Hexaline circa mid-2011. Incidentally, the casino game’s name Hexaline’ is a synthesis of two words—“hexa” and “line”. In geometry, the prefix “hexa” refers to a six-sided or six-angled shape. “Line” implies the basis for winning. Generally, the comb-like Hexaline has eighteen hexagons—which form a chain link—that are designed in five rows. The first, third, and fifth rows—when counted from the left side towards the right side, or vice versa—have four hexagons each, whereas each of the second and fourth rows have three hexagrams. These hexes come in six unique colors. First, there are two lowly valued hexes, which are green-colored and purple-colored; both winning hexes have equal values, which is a fifteenth of the most valuable winning hex. Secondly, there is a lemon yellow-colored winning hex whose value is a fifth of the most valuable winning hex. Third, the value of the red-colored winning hex is a third of the most valuable winning hex. Fourth, the value of the blue-colored winning hex is slightly over half of the most valuable hex. Lastly, the most valuable winning hex, which is named wild’ and occurs in shades of both white and deep pink, is fifteen times that of the two lowly valued winning hexes. Playing Hexaline is unproblematic because a player only has to place his or her stake before pressing the “Play” icon. The objective of Hexaline is to have lines of hexagrams that run from the left side all the way to the right side, and can also be combinations of vertical and horizontal lines consisting of differently colored hexes (wild’ winning hex plus any other). The payout of Hexaline is determined by and dispensed per hex basis. Fortunately, a Hexaline player can win multiple times in a single spin thanks to combinations of vertical and horizontal hexagram lines. Red aside, the Hexaline colors are renowned for their soothing tendencies. The interface is uncluttered because Microgaming prioritized the necessary features namely “View Rules”, “Play”, and “Stake”. The interface is catchy and navigable such as the “—“ and “+” icons for (re)adjusting stake. Hexaline has a flip side. It is easy, especially concerning a first-timer player, to know if they have won—the pop-ups read thus: “hex-a-win”, “You win!”, and “clocked another win”—and the amount won; so, why should not a player be either notified when he or she loses or reminded of the stake lost. A distracting small replica of the Hexaline game, which is on the top left side of the interface, keeps on showing examples of winning lines. There is no recommendable strategy because there is no switching–the nature of dealt hexes is cast in stone–unlike in some online casino games such as Oasis Poker. However, it is advisable for a Hexaline player, especially a first-timer, to experiment with Hexaline using the Free Play feature to get a feel of the game. Information about the house edge and return to player of Hexaline are scanty. However, a particular renowned casino operator authoritatively cites a house edge of about 3.3%; the return to player rate: 96.7%. 1 Video Slots Has over 30 different speciality games!! 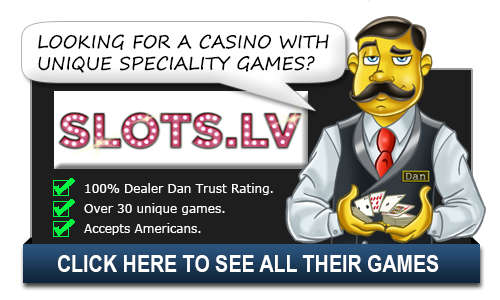 2 Bovada Casino Great selection of non-traditional gambling games. 3 Slots.LV $22 No Deposit Bonus just for registering, Good games.